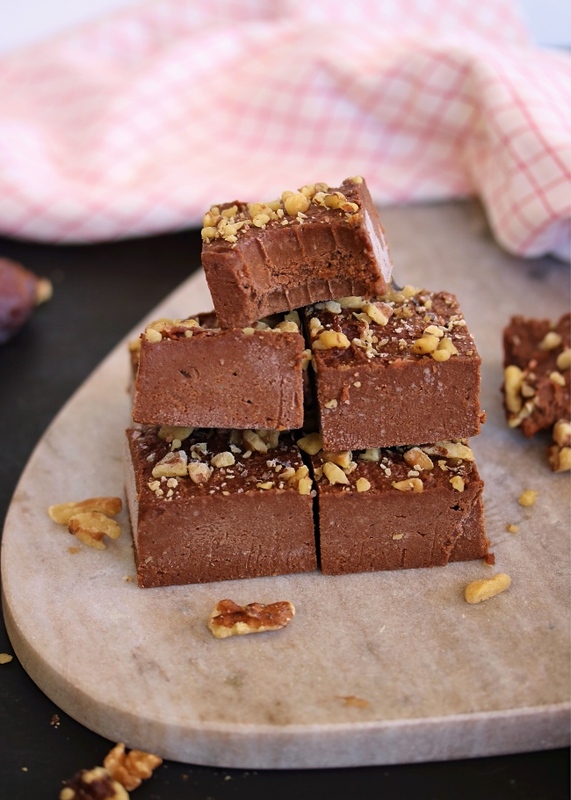 The holiday season always has me craving fudge... but the easy kind that doesn't take major skills or forever to make! 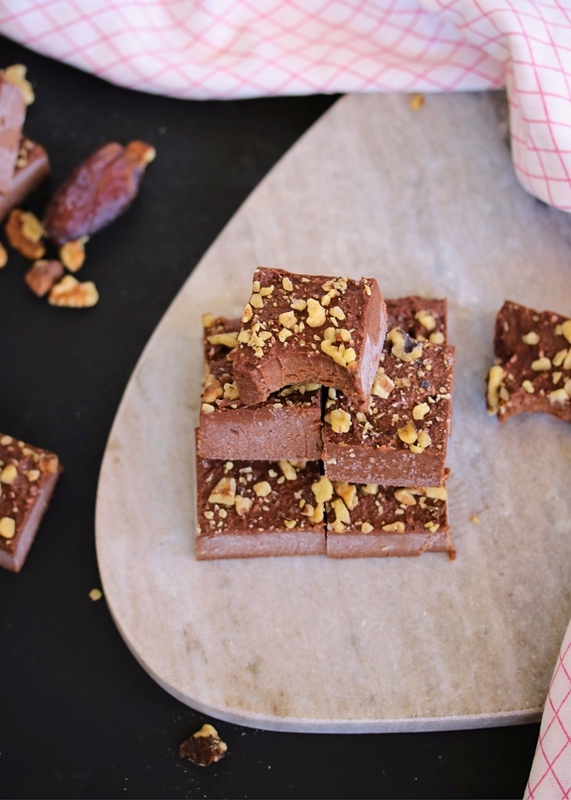 This Chocolate Freezer Fudge is sweetened only with fruit: dates! 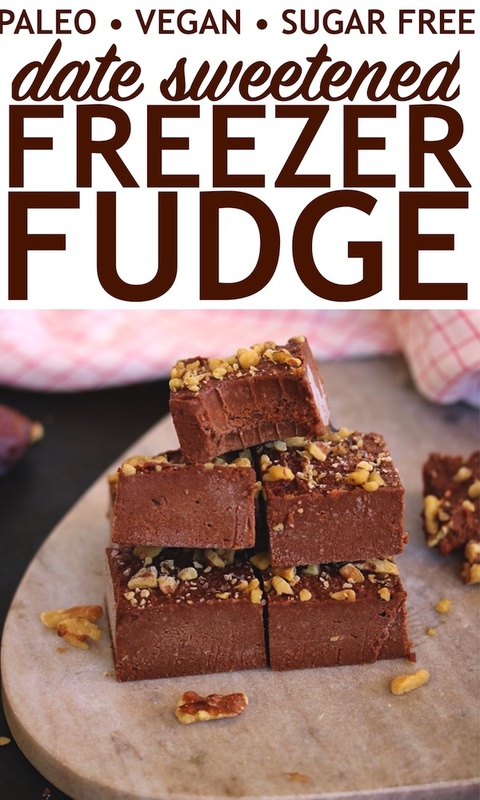 We buy a big pack at Costco or Trader Joe's (though you can find them at most grocery stores now) and blend into a quick and easy fudge that sets up & stores in the freezer. Fudge is ready & waiting to be snacked on or shared with guests anytime, as it only needs a couple of minutes to thaw and keeps for months! I chose dates to sweeten this fudge for a couple of reasons- one being the natural sugar instead of something refined. 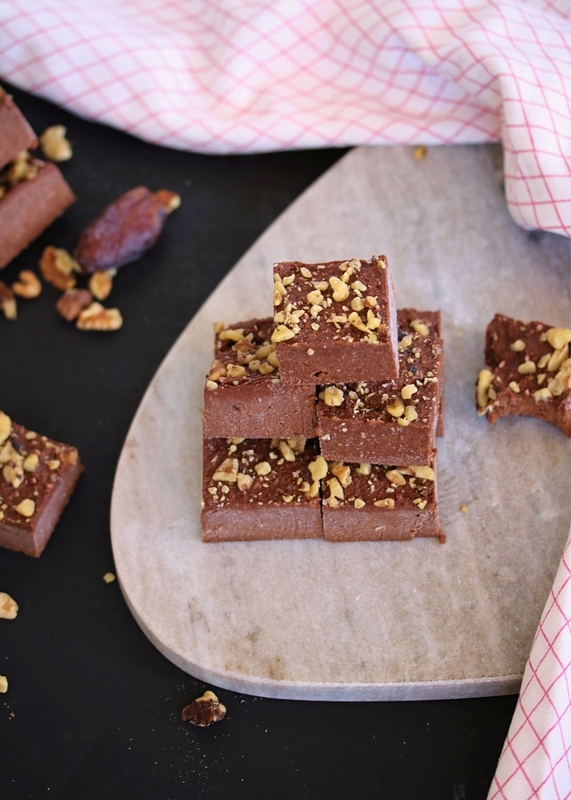 This makes a Paleo-friendly fudge that's even vegan too! Second reason: pregnancy. There's a rumor out there that dates can ease labor, and even if this rumor is false- I'm all about trying it out! Dates are good for you anyway, so no harm done right? If you're pregnant too or just curious, here's an article from Mama Natural with some research on dates & their effect on labor. The recommended # of dates for all the supposed benefits is 6 per day, if they're the smaller Deglet noor dates. If you're using Medjool (my personal favorite because they're bigger & softer), then 3 should do. 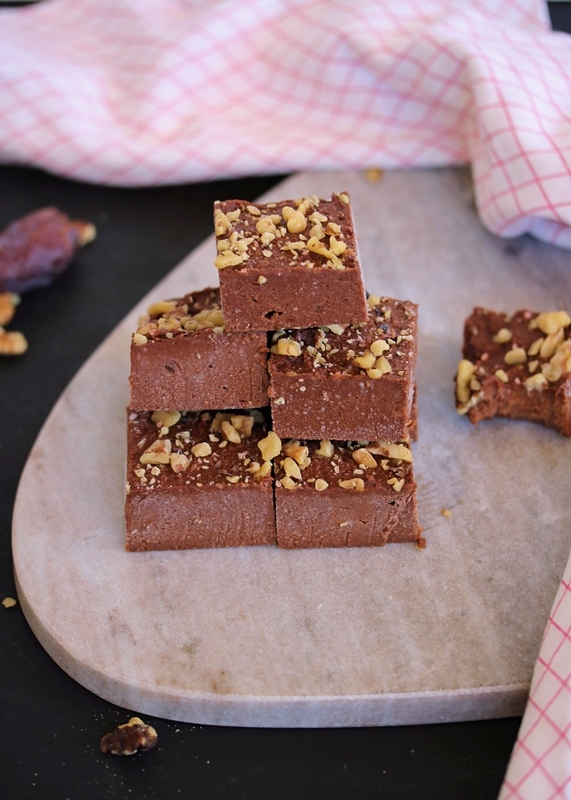 So how cool is it that you can get your daily dates in with fudge!? I'm not saying no! If pregnancy is the furthest thing from your mind, dates are still awesome. They're a great source of fiber, magnesium, potassium, folate, and Vitamin K. All things I'm looking to add to my diet during these last weeks of pregnancy, but also beneficial nutrients for everyone! 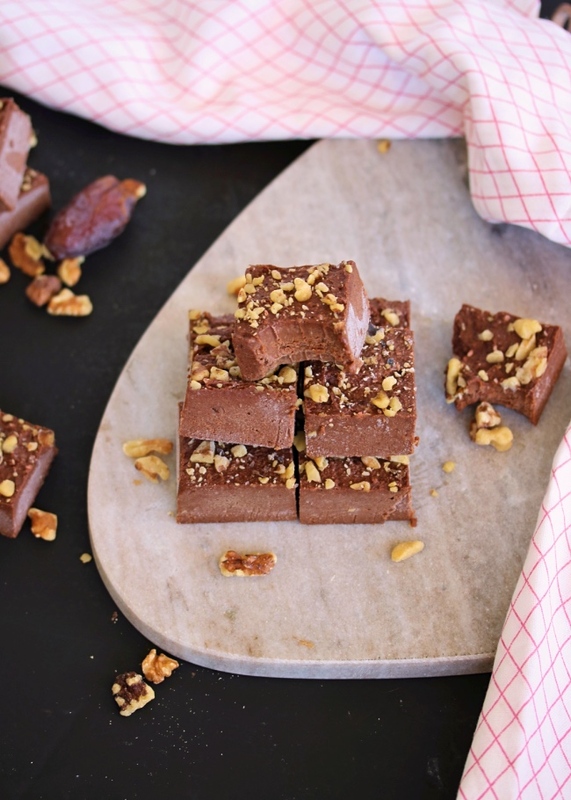 So buy yourself some dates (we've actually been getting this container of them from Amazon and they are the best I've had) and give this naturally sweetened, refined-sugar-free fudge a try. Your taste buds and your tummy will love it! Line an 8 or 9" square baking dish with parchment paper and set aside. Add the pitted dates and raw cashews to a medium bowl and cover with hot water. Let them sit for at least 10 minutes, or up to 2 hours to get soft. Rinse, drain, and transfer to the food processor. Add the melted coconut oil and cacao powder, and pulse until super smooth (scraping down the sides of the food processor as needed). Pour the fudge into the lined baking dish, smoothing over the top. Top with chopped nuts & coarse salt if using. Transfer to the freezer until set, about 1 hour. Slice into squares. To serve: remove from the freezer for a few minutes before serving, or until just soft. 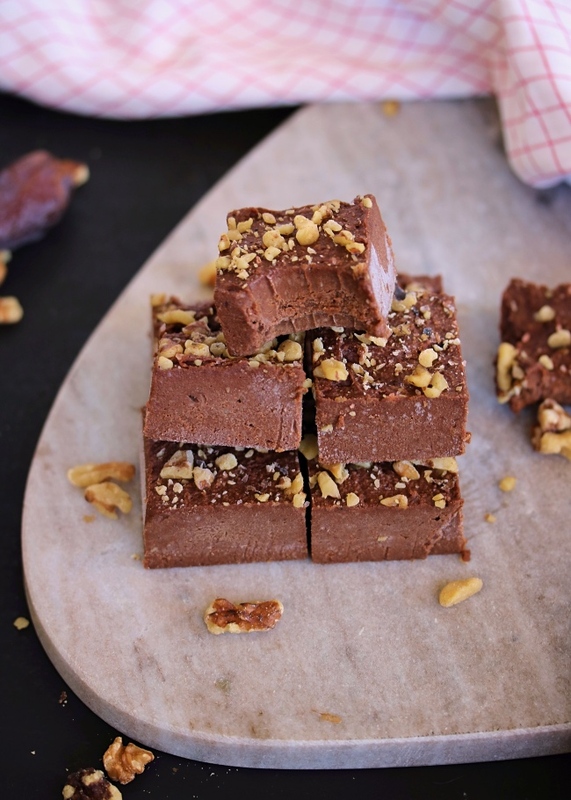 Store leftover fudge in the freezer. Cacao and cocoa powder work interchangeably in this recipe, just be sure that whichever you use is unsweetened. Once frozen, I keep the sliced fudge in an airtight container or freezer safe bag for up to 2-3 months. Want a soft fudge? No worries! This is great stored in the fridge, too. It just won't last quite as long as the freezer- but the texture is perfect! Absolutely delicious recipe. I have never tasted anything so yummy. I am going to make this again for Thanksgiving for my family. There is also a new product on the market it is a date syrup. Expensive, but so good. I'm worth spending the extra $$$.Dates are starting to become very popular for baking, especially in Israel.